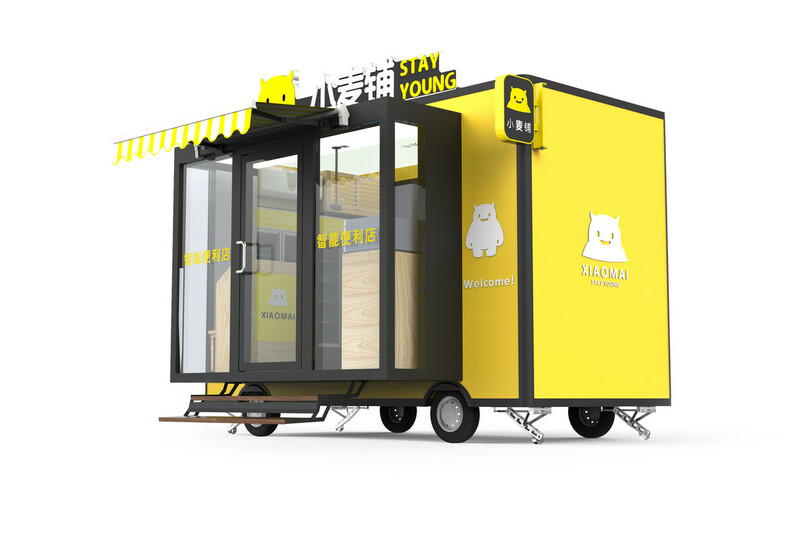 XiaoMai Launches Convenience Food Kitchen And Mobile Delivery Carts - Will It Be The Next 7-Eleven? 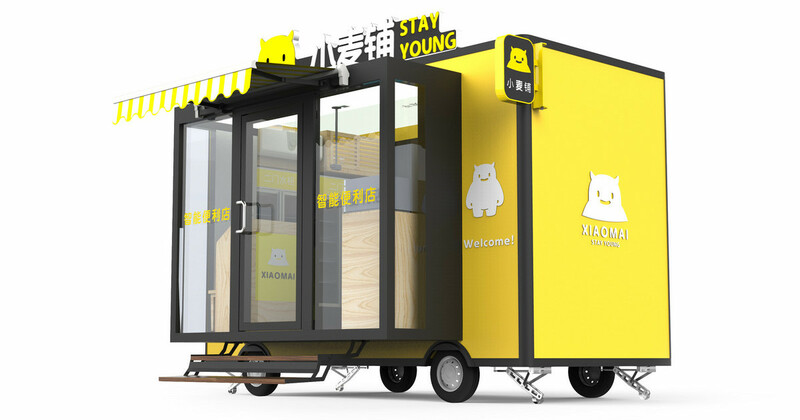 XiaoMai has launched mobile delivery carts and their own convenience food kitchen called DaShiZhiWei “master taste”(大师之味) — convenience food will be one of their core products in the future. Customers can buy their meals via the app half an hour in advance, and collect the meal at any of the mobile dining carts. The price of a meal is about 13-15 RMB. DaShiZhiWei partners with celebrity chefs who set the menu and recipe; XiaoMai then takes the recipe for mass production. A cart can be built in 4 hours. The current and their fifth version is an improved version from previous design with added features. It is movable and expandable and is suitable for neighbourhoods, colleges and office areas. XiaoMai’s mobile dining cart is designed for convenience food and is suitable for office workers. There is a kitchen in the cart and while the driver (also the salesman) is on his way to deliver the food, the food will be heated for fastest delivery. This model eliminates most of the rental and labour cost. With low costs, profitability can be achieved easily with a stable customer base. China’s catering industry hits nearly 5 trillion RMB and there are opportunities in different niches. XiaoMai targets the niche market who wants convenience and a good meal. However, Chinese food cannot be standardised the same way as Western fast food. It is challenging for XiaoMai to produce satisfying and safe convenience food while maintain quality, quantity and price at the same time. XiaoMai’s aim is to deliver food for “double the taste and half the price”. At present, XiaoMai sells four main food categories: pasta, Sichuan cuisine, Taiwanese lunchboxes, and salad. When choosing partners, they prefer partnering with local restaurants. The chefs in their research and development team are masters in Sichuan, Shandong, Guangdong and Huaiyang cuisines. They were former chefs from Beijing Hotel, Quanjude who is famous for their Peking duck, traditional food restaurant Fengze Garden, and so on. They are also food critics in the Chinese food and beverage industry. With much research and experiment, XiaoMai is now able to mass produce food that has 85% similarity compared to the food cooked by these masters. Currently, there are 80 options on their menu and a cart will have about 8-12 options, rotated regularly. A cart can support 100 meal boxes a day and will make a profit if sales are more than 50 boxes a day. The cart operates during lunch hours because demand for convenience food is the highest during lunch and has the highest profit margin. XiaoMai has their own fresh food factory, which integrates the procedure of processing, cooking, logistics and distribution of fruit and vegetables, meat, rice, noodles and agricultural products. It also owns an SC food production license. In the future, XiaoMai hopes to build a fresh food factory in every city and expand its operations to breakfast and dinner delivery. XiaoMai will scale their business with a franchise model to encourage small business owners to start their own food delivery business. They plan to validate their model in one city with their first batch of 100 food delivery carts. The first version of XiaoMai was tested in April 2017 and completed two rounds of financing amounting to 245million RMB in July and September 2017. At present, there are about 100 sets ofXiaoMai carts of about 20 square meters. The carts can be placed indoors and outdoors, with more than 600 SKUs and about 30% of profit margin. This article is powered by AI; and was first seen on KRAsia.